Help Needy Writers → ← Halloween’s Over, But This eBook Sale is Monster! But, what if I wanted to see some harm befall an elvis impersonator? Don’t get me wrong, I’m sure they’re all great people, but I feel like they should be the red-shirts of Las Vegas. Certainly possible. I have at least a couple things planned for Vegas, though at least a couple won’t happen for a while. *cough* There’s a certain acrobat there with a …colorful history… with Zita among other things. So Vegas is definitely in the cards, so to speak. 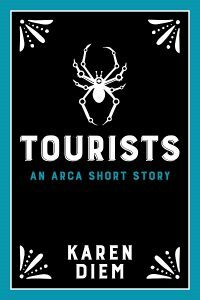 Tourists has a new cover, visible on my Books page.